Bolivian soldiers have begun producing tens of thousands of bread rolls because of a bakers strike. The army is helping to supply the population of the country's main city, La Paz, and neighbouring El Alto. The government called in the troops when there were reports of shortages in several neighbourhoods. 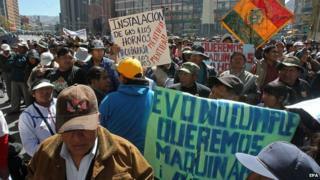 Bolivian bakers went on a 48-hour strike in protest against a government decision to scrap subsidies for wheat flour. "We have, indeed, experienced some shortages. But we will produce 70,000 rolls (today) and we have the capacity to increase the output if necessary," said Development Minister Veronica Ramos. The government will sell the bread rolls at state-owned shops for 40 cents of the local currency, the boliviano ($0.05). The bakers say they need to sell each roll for 50 cents in order to make a profit ($0.07). The left-wing government of President Evo Morales says subsidies for wheat flour are no longer required. "Bolivian bakers have benefitted from subsidies for many years. They are strong now and can walk with their own legs," said Ms Ramos. Bolivia is one of the poorest countries in South America. But poverty and inequality have been greatly reduced since Mr Morales was first elected. Bolivia: All with Evo Morales?